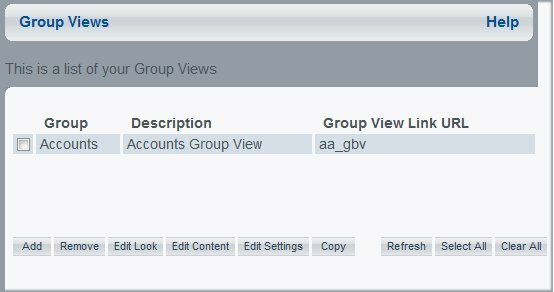 As a Managed Reporting user permitted to access View Builder, you will use the View Builder to create a public or group view from the Public Views or Group Views window. When you create a public or group view, you must supply a description for the view. The name of your view is automatically generated and you can find it in the Link URL column. A folder using the link URL name is created in the worp_users folder. Files named content.xml, layout.xml, and user-preferences.xml are created in the worp_users folder. The following image shows the View Builder Group Views window containing an available group, its description, and URL link. From the Welcome page, click the Tools menu and select View Builder. to directly access the View Builder . The Public View window opens. To create a group view, click Group Views. From the Public Views window, click Add. An input form displays at the bottom of the Public Views window. Enter a description for the public view. The new view is added to the Public Views list. A drop-down menu for the Group Name and an input field for the View Description displays at the bottom of the Group Views window. Select a group name from the drop-down menu. The View Description input field is populated with the Group Description for the Group Name selected. Edit the View Description for the group view, if necessary. The new view is added to the Group Views list. Group Administrators can access the View Builder to create and edit Group Views and Library Views for the groups they administer. 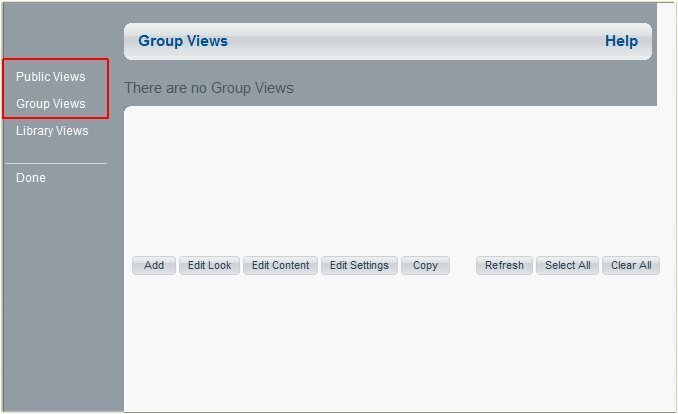 The following image shows the View Builder where Group Views can be accessed. Group Views is the default page displayed after logging on to the View Builder. Only the Group Views that the Group Administrator is administrator for are displayed in the Group Views page. Options for Public Views, Manage Users, Toolbox, and Management are not available. Manage Users and Management options are available to users granted permission to access these options.